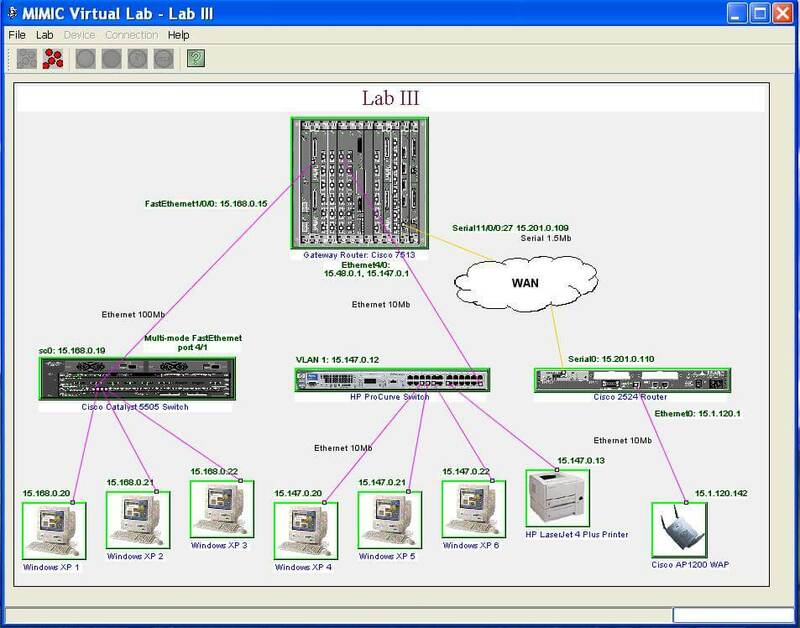 MIMIC Virtual Lab is specifically developed for enterprises to better evaluate, test, demo, and train on Network Management applications. Its out-of-the-box functionality provides many ready simulated networks along with the test scenarios. It creates a real world lab environment with networks populated with devices from different manufacturers and provides access to the devices--via SNMP, Telnet, TFTP and Cisco IOS® software. There are five labs included with this software. 1. This lab has many devices and connections. 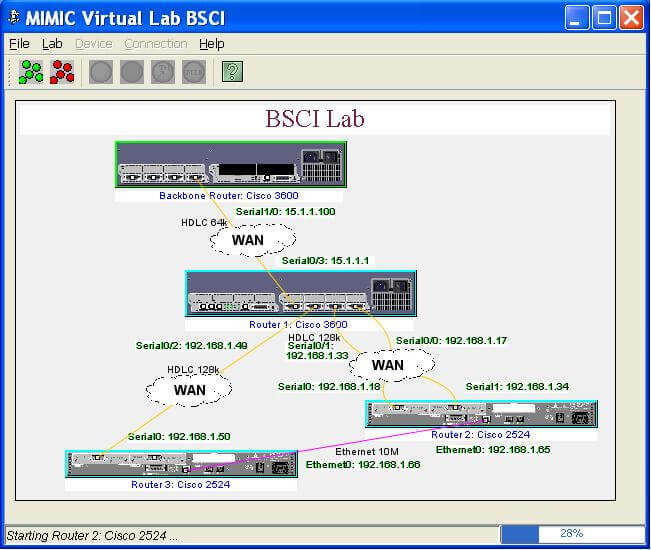 - This lab is also designed for Cisco BSCI test preparation. 3. This lab contains 12 devices. 4. 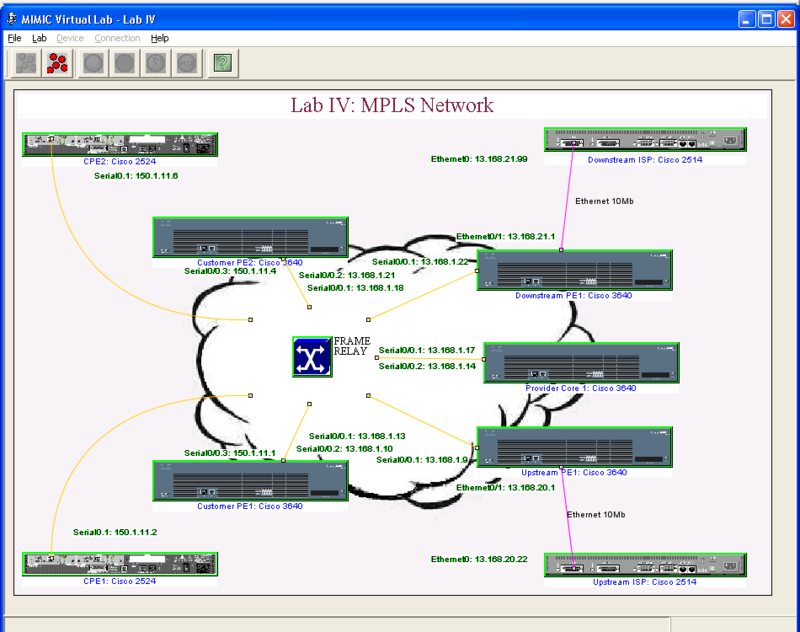 This lab has a support for MPLS MIBs. - The lab exercises are focused on routing protocols - BGP, eBGP, RIP, OSPF, IGRP, and EIGRP. 5. 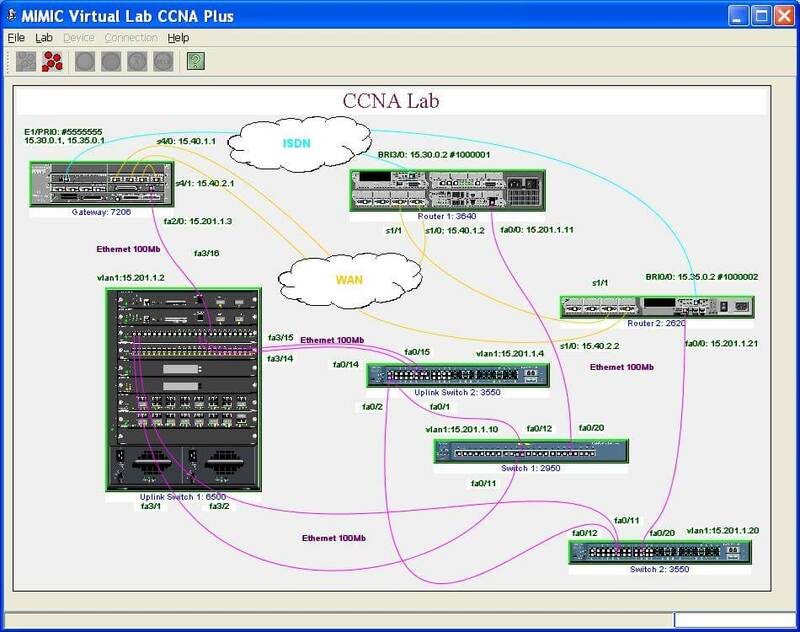 This lab is designed for Cisco CCNA certification. Connect using SNMPv1, v2, v2c, v3; TFTP, Telnet and Cisco IOS® software. Run "test exercises" connected to different devices to generate different test scenarios. You can also discover and cofigure using management applications such as HP OpenView, CA Unicenter, CiscoWorks, CiscoWorks 2000, CiscoView and CEMF (CDM, GSR Manager), just like real devices. If you are interested in creating your own devices and topology, MIMIC Simulator tool kit is also available. You can simulate as many as 100,000 devices in a lab. It includes MIMIC Recorder to record devices to help create the lab topology you need. Each lab comes with a set of test exercises, which let you create many pathological conditions in your simulated network. These are test conditions that would commonly be performed while evaluating or testing network management applications. Devices going down and coming up -- several devices issue Link Up/Down traps at the same time. Bad link -- packet drops every fifty packet. MIMIC Virtual Lab - Enterprise can be customized to meet your specific needs, including branding and localization. Below is an example of a Chinese language version of MIMIC Virtual Lab. If you are interested in creating your own devices and topology, MIMIC Simulator Suite is also available. You can simulate as many as 20,000 devices in a lab. It includes MIMIC Recorder to record devices from any manufacturer to help create the lab topology you need.